Ideal for clamping frames up to 2.2 m x 2.2 m.
If the PushMaster is inserted in this device it becomes a sturdy press for inserting Vee nails. Supplied without a pushmaster. An economical lightweight cord clamping system. The cross beam clamps the frame corner tightly to the base. The strap clamp is still used to hold the frame while joining. 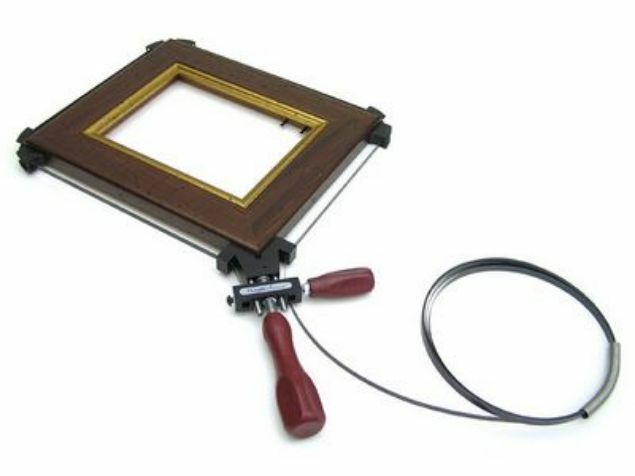 Tool to insert V nails and backing nails in frames. A powerful, single corner clamp suitable for large or complex shaped mouldings. Complete kit containing the tool to insert the V-nails and flexipoints, as well as some 400 V nails, together with some flexipoints and backing nails. Ideal for clamping frames up to 1.2m sq.